Now you can be Nyan Cat! Bored with the plain red brimstone? Well, then this mod is for you! All lasers in the game are now rainbow! Please leave me feedback down in the comments! 1.] Download the mod below. 2.] Unzip the file "prismstone_1.7.rar" using your favorite extractor. I&apos;ll get back to you! - Another update? Already? Why yes! - New video is out! - This update might seem small to you, but OH BOY it took a while! - My previous Nyan Cat sucked. I made a new one! - It's SOO MUCH BETTER! - Also, ingame graphics now match the item icon. I like the one for Tech X. - Finally, FULL Rebirth support has been added! - Drag the files in the appropriate folder (resources_Afterbirth or resources_Rebirth) to your resources folder. - THE MORE RAINBOWS UPDATE! 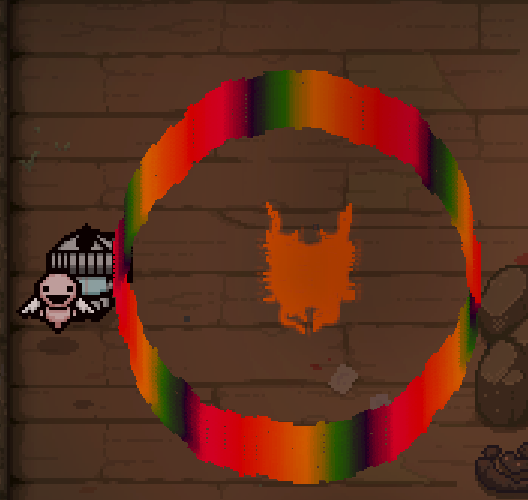 - Brimstone now makes you Nyan cat! - Better gif that took me forever to make! - I am currently working on better gifs. - Cycling from purple to red is much smoother. - Shoop da Whoop impact fixed. - Brimstone's name and description changed. - Technology-style lasers are different... find out how! I love this so much, I&apos;ve watched so many youtubers use this and i&apos;m glad I found it! Can you help me plase? The lasers are rainbow but the brimstone is not. Guys I found the wae to make this work in ab+! All you gotta do is go to your documents, afterbirth+ mods folder, and go into any mod, then paste the content of the "gfx" folder of prismstone into the "gfx" folder in the resources folder of the mod. Is not hard at all and it worked for me! does it work on AB+? Great mod, but is there any way I can just have the laser changed and not the sprites of the items and character appearance? Please comment. Try deleting the bosses, characters, and monsters folders. Oof. Thanks for letting me know, don&apos;t think there&apos;s anything I can do about it now. Darn. Sorry I told you about it so late, haha. haaaallppppp.. The lasers work, but brim doesn&apos;t! Thanks for putting a Rebirth option, now I can play Antibirth with it! Guys if it doesnt work for afterbirth+ i believe i have the solution go to documents my games and then afterbirth+ mods drag in the afterbirth ver and try that. is it possible to make a version where it&apos;s not .rar? could you add it to the steam workshop pliz because it dont work for me i dont know why it just doesnt change anything ! Is there a afterbirth plus version yet?